Let’s see the North American newspapers print something about THIS. Yesterday, when returning along the Cancun highway from Izamal after a hard day of eating tacos at Wayan’e, visiting antique shops and visiting the yellow city of Izamal, I passed a car parked on the side of the highway just in front of a state police truck, lights a-flashing as usual. Glancing back in my rear-view mirror I noticed two white people and a pile of suitcases next to the car and thought to myself “these folks could probably use a little assistance” and upon returning to the scene, found a mother and daughter pair of Canadians who were stuck there and had been for the last 3 hours. SPV heroes taking care of our visitors thank you very much. Publish this, CBC! Turns out their rental vehicle – a crappy little Nissan Tsuru – had caught fire (literally, there were flames coming out of the motor) and they had to abandon the vehicle before a good Samaritan in a BMW stopped with an extinguisher and put it out. Also, villagers and passers by offered water for the now red-faced (from the sun) Canadians. Things were friendly enough but the state police folks wouldn’t let them go until the federal police showed up to take over the situation (the Cancun-Merida highway is a federal highway) and make sure everything was hunky dory. The state police had already contacted the feds, but three patrol cars had already driven by and none had stopped; meanwhile the rental folks back in Cancun had told CanadaMom and daughter that someone was coming, but of course as they had no office in Merida, this might be a while. Needless to say, Mom was a little tense but they were good sports about it and had been talking about food and recipes with the policemen who were reluctant to leave the scene or the ladies. After talking to the rental agent in Cancun and telling him where his rental car was and where his customers would be to get them another vehicle, and then the police assuring them that everything would be fine and the ladies were coming with me, I loaded them all into the car and away we went. They assured me that they at no point felt unsafe or threatened in any way; just frustrated with the pace of the resolution of their situation. Let’s see the North American newspapers print this story! 1) Rent your car from an agency that is established and has offices in both Merida and Cancun in case something like this ever happens to you. It’s an unlikely scenario, but it can happen. 2) If your rental car catches fire in Mexico, make sure you are in the Yucatan, the safest state in the country. Good one and agreed nobody in the US or Canada will publish a story like this. If its not bad and misrepresented news then it isn’t worth publishing about Mexico period. Indeed, the Yucatan is incredibly safe! Good Testimonial, AND the police here, for the most part, really are here to help. However, This is why I always advise people coming over from Cancun to take the bus, if you need a rental car – do it here! There is the Bus directly from the Cancun airport in to Merida now! Lucky for these two you came along. Absolutely wonderful story, who knows how long they might have been waiting if you hadn’t come along and rescued them, not only by taking them to their destination, but also by speaking to the rental car agency in Cancun and reassuring the state police that they didn’t have to worry about these women any more. I also love how all the Yucatecos, from the BMW driver to the villagers to the policemen pitched in to take care of these visitors who must have been quite terrified by their ordeal!!! Just think of the wonderful stories they will be able to tell back in Canada at the end of their vacation. I am the daughter of the mother and daughter team and can confirm that this story is all true! Okay, the car was crap, but we did meet a lot of really fabulously nice people in the course of this ordeal. 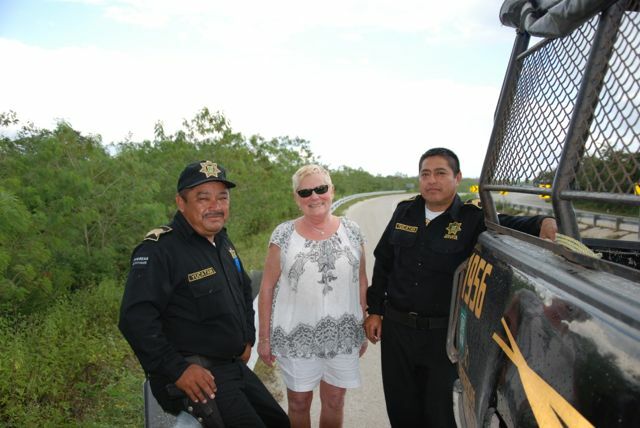 The Yucatan state policemen really went beyond the call of duty to make us feel secure at the side of the highway and I come away from this experience not only with a renewed respect and appreciation of Yucatecans, but also with a lot of great ideas for Christmas dinner recipes. Thank you to everyone who helped us, we will definitely be back again, hopefully with a better car! Hola Jenna! So nice to hear you are alive and well (and have internet!) Enjoy your vacation!! You’re probably right, Ray – not enough mayhem in this story for the media up north! Thank you for this great story. I travel to Yucatan a lot and I love the region. I been traying to promote Yucatan because every time that i go there, everything is perfect and safe I will recomend you to read Xtabentum: A Novel of Yucatan. Is a easy to read novel set in Yuctan. I just want people to know how rich in culture this region is. Thank you for sharing. Good for you, WL, always ready to save the day!! Have retweeted and posted. About eight years ago, we had a similar experience. I was with my daughter and her girlfriend (15 years old) and our car blew a tire. We were on a stretch of the highway that was totally deserted and it was 100 degrees outside at least. I thought we were doomed… like the newbies we were, we had no water in the car. Within five minutes, a policeman came and stopped to find out what was wrong. When we told him, he called the Green Angels on his phone (we didnt have a cel phone then), and stayed with us until they showed up. The Green Angels took off the tire on our SUV, put on the spare and sent us on our way. They wouldn’t take a penny from us, though we tried. What could have turned into a disaster, turned into a comfort. We have never felt unsafe on the carretera between Merida and Cancun since. Great story, Mr. Lawson! Thanks for sharing! I loved this story… my boyfriend and I can relate, and after a couple of trips to the Yucatan peninsula, the best parts of our trip were spent outside of the Cancun/Playa del Carmen tourist trap zone. Everyone in Merida, Progreso, even tiny Ek Balaam village were so hospitable and friendly, and even the tourists we ran into seemed to have this laid-back, let down their guard friendliness that you just dont get staying on the busy beach strip. We vowed that the next time we rent a car in the Yucatan, we rent from the airport. We have had too many unfortunate experiences with local rental car places, a lot of bait and switch tactics, and since we love to drive, a car is a necessity for us. That’s not to say you need a rental car, but it’s our preference. Thank you, great story! I am sharing on my facebook wall! What a great act, and you are right, it will net reach the media, because it is good news. I have never felt afraid in Mexico and I visit every year. I use local transportation and I roam neighbourhoods away from the tourist destinations. I will be returning in feb.
As always Yucatan is one of th safest states in Mexico and people are always helpful and friendly. Great job! Too funny! Crappy car rentals when one plans to travels around the peninsula seems all too common! My favorite was the car they rented to us without antifreeze. Of course, it siezed up just as my husband was arriving in Valladolid (I was still in Cancun) on his way to his village. I got to deal with getting the rental company to my husband via phone from the hotel since he is useless at these types of things! I’m not sure if they ended up sending a car from Merida or Cancun, but they were deeply confused by my directions. They kept asking the name of the place he could be found or a specific address. I finally just said: drive to Chichimila, 5 miles south of Valladolid. Tell your rental company employee to stop in the park and ask to be directed to the store of Don Petim. He will know how to locate his son, who is the one who needs the car. Car Rental Guy: Um, what? Please just give me an address. Me: I don’t know the address, and the address will be useless. Just follow my instructions. You can also ask anyone to point out the store owned by The Tiger. They will help you find his son. Care Rental Guy: So the car isn’t in Valladolid at a hotel? Me: No. Go to Chichimila. Find the Tiger’s son. It’ll be all good. My husband and I have been going to Mexico for years. We finally purchased a house there and go at least twice a year. We fly into Cancun and rent a car drive to Chelem what a great drive so peaceful and we always stop at the service station and get something to eat. The people there are so welcoming and friendly. We speak very little Spanish and what I do its hard to understand. I can’t wait to go back this year.